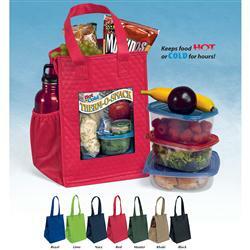 The Therm-O-Tote Custom Lunch Bag with insulation. 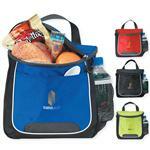 Premium non-woven polypropylene insulated lunch-style tote with zipper closure, 7" side gusset pocket, dual reinforced 18" handles, and plastic bottom insert. Available in red, hunter, khaki, black, navy, royal blue, lime and pink. 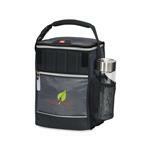 A unique custom lunch bag by Adco Marketing. With friendly people ready to help, give us a call at 888-332-ADCO! Available Colors: Available in red, hunter, khaki, black, navy, royal blue, lime and pink. Typical Imprint Area(s): 5"w x 7"h.
Available Imprint Options: Color print or full color available with our color vista process, please inquire. 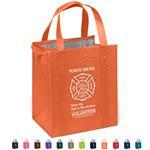 Non Woven Therm-O-Tote Lunch Cooler Bags, custom imprinted, insluated.